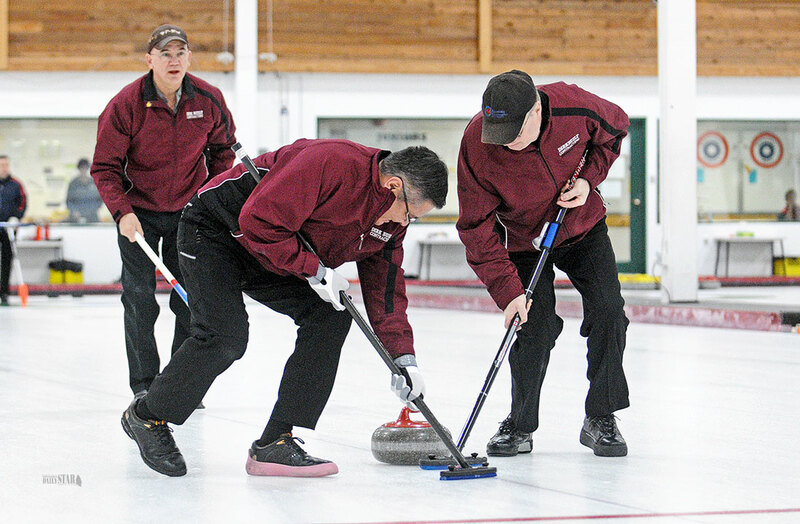 REPEAT WINNERS – Skip Walter Wallingham, left, instructs teammates Ed Kormendy, centre, and Don Duncan to sweep during a round-robin game at the senior men’s curling championship in Whitehorse Dec. 20. STONE WHISPERER – Team Mikkelsen third Doug Hamilton wills a rock to do his bidding during senior men’s curling championship action Dec. 20. This year, Walter Wallingham didn’t need any help. The 56-year-old skip led his team to a 5-1 record at the Yukon Curling Association Senior Men’s Championship Dec. 18 to 20, good enough for the rink to book its second straight trip to nationals. The 2016 Canadian senior curling championships will be held in Digby, N.S., March 19 to 26, at the Digby Area Recreation Centre. 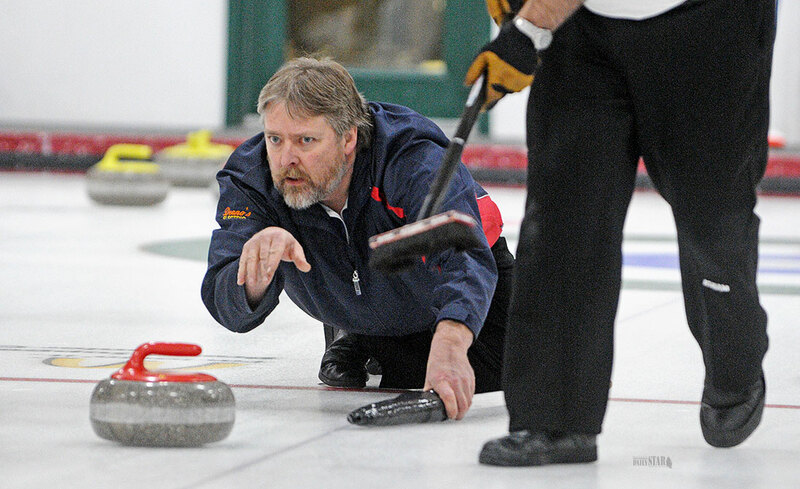 Last year, rival skip Ray Mikkelsen filled in for Wallingham at Yukon playdowns, after the veteran skipper booked tickets to watch his son, Joe Wallingham, skip Yukon at junior nationals in Corner Brook, Nfld. Led by Mikkelsen, Walter Wallingham’s rink bested 2013 champion George Hilderman in a best-of-three series. This year, Wallingham and co. dominated a four-team field in a double round-robin tournament at the Whitehorse Curling Club, emerging 5-1 thanks to a final 9-3 victory over – you guessed it – Mikkelsen. Wallingham’s roster also includes third Gord Zealand, second Ed Kormendy and lead Don Duncan. Kormendy replaces Herb Balsam, who played with Wallingham last season. The team curls together every Tuesday and Thursday night. Wallingham and Duncan received some extra motivation when their daughters – former Scotties teammates Patty Wallingham, Chelsea Duncan and Jenna Duncan – showed up to watch their final game from the curling lounge. Both Wallingham and Mikkelsen entered their final round-robin matchup with 4-1 records, with Wallingham emerging victorious 9-3 after just six ends. Last season, Wallingham finished 1-8 at nationals, with the lone win coming over Saskatchewan. “We’d like to collect our thoughts and do a little better this year,” he admitted. Senior nationals include players age 50 and older. Hilderman’s rink finished second in last week’s Yukon playdowns at 4-2, while Mikkelsen went 3-3 and Darol Stuart failed to win a game in six tries. Wallingham’s final scores were: 7-6 over Hilderman in extras, 7-5 over Stuart, a 5-4 loss to Mikkelsen, followed by second wins against Hilderman and Stuart, 7-4 and 5-2, respectively. Three other teams also punched tickets to nationals this month, all by declaration due to lack of competition. Leslie Grant will captain Yukon’s senior women at nationals, accompanied by third Corinne Delaire, second Joan Hyvre and lead Laura Wilson. And in junior action, teams led by Brayden Klassen and Alyssa Meger will lead their respective rinks at the 2016 Canadian junior curling championships in Stratford, Ont. Junior nationals will be held Jan. 23 to 31 at the Stratford Rotary Complex. Joining Klassen are long-time running mates Spencer Wallace at third, second Trygg Jensen and lead Will Klassen (Brayden’s younger brother). Curling with Meger will be third Emily Matthews, second Peyton L’Henaff and lead Zaria Netro. It will be Meger’s first nationals.